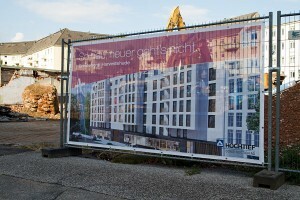 In July we saw the sad outcome of the referendum concerning the Hoheluftkontor in Hamburg, where NIMBYism averted the construction of a building on a site next to Hoheluftbrücke subway station, but now there are some positive developments just 200 meters southeast of that site: Construction of a new residental building on Grindelberg will be underway soon. Located on the former site of an auto repair shop and a long-abandoned detached house (both buildings have been demolished by now), the seven storey building will extend the existing line of buildings that span the curve of the street. Posters with renderings of the building have already been put up along the site fence (see the second photo on the right). 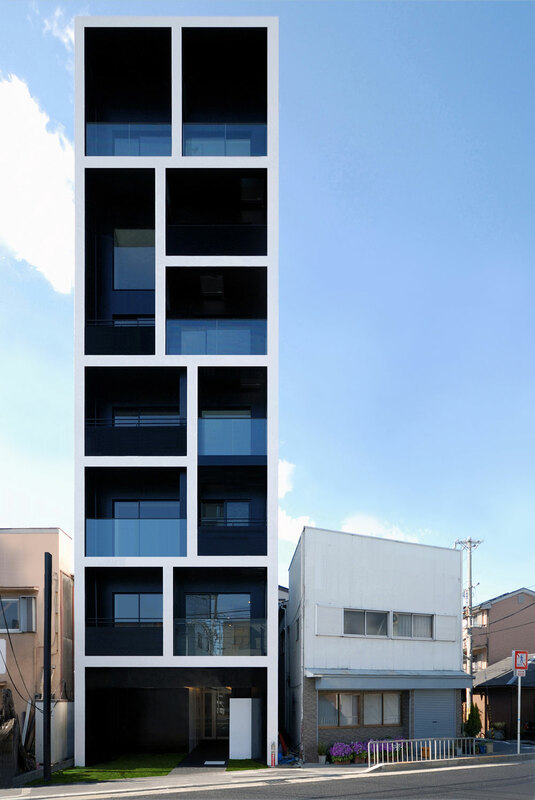 They show a building with a relatively simple facade plastered in white. Several bays are pulled out of the facade towards the street, each stretching upwards for nearly the entire height of the building. 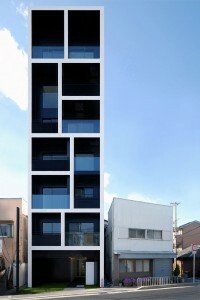 Both of these design elements – white plastered facade and bays – reflect the facade of the building next door, making the new building a good continuation of the existing row of buildings. This is very sensitive design and contextuality at its best. The row of buildings actually begins at the intersection of Grindelberg and Schlankreye with a Gründerzeit building sporting the typical ornamental facade, bays and gable fashionable at the time. The next building, a circa 1990’s development, retains the same architectural elements but simplifies them into a then contemporary language. Of special note is the gable, which looks massive when seen from the front of the building, but is really just a mock-up, anchored to the roof by metal beams, as can be seen from the side. The new building that is about to be built next to it gets rid of the gables in favor of a set back top floor, but retains the bays, white plastered facade and orientation of the windows. As this is a rather lively area, all buildings feature shops on their ground floors, something that I am happy to see present in the new building as well. Although it relates closely to existing neighbors, the new building still manages to develop a distinct formal language by adding balconies at the bays, and those balconies are defined by irregular, golden handrails which look rather interesting in the renders. The same kind of lattice is used for the gates that lock the passages that allow cars to enter the parking lot in the backyard (or even an underground parking lot?). The ground level seems to be clad in some dark brick and featuring very wide shop windows with – again – golden frames. According to additional renders displayed on site, the rear side of the building, inside the block, will feature patios and gardens that will offer the residents a quiet refuge away from the busy street. The building has been designed by young architectural office Schenk + Waiblinger Architekten, who have recently completed a very interesting office building on Domstraße in Hamburg’s Altstadt district – one of my favorite current buildings in Hamburg. Also, they have created a building right next to the Elbphilharmonie. Their residential building on Grindelberg seems promises to become another beautiful piece of work and I am looking forward to see it completed. 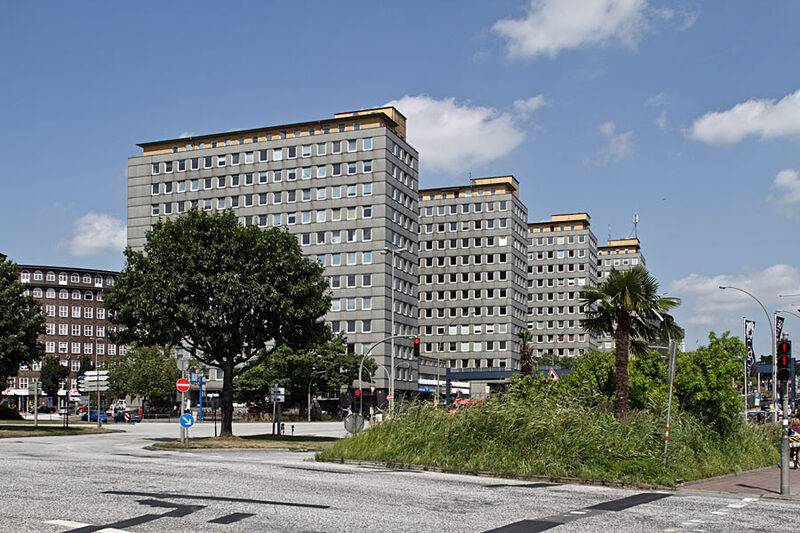 Situated between the Central Station and the exhibition halls Deichtorhallen, in close vicinity to Hamburg’s famous office building district of the 1920’s, you can find a complex of four high-rise buildings which were designed by Rudolf Klophaus and finished in 1955. These buildings called City Hof were the first high-rise buildings built in Hamburg after World War II and showcased the latest and most modern architecture. 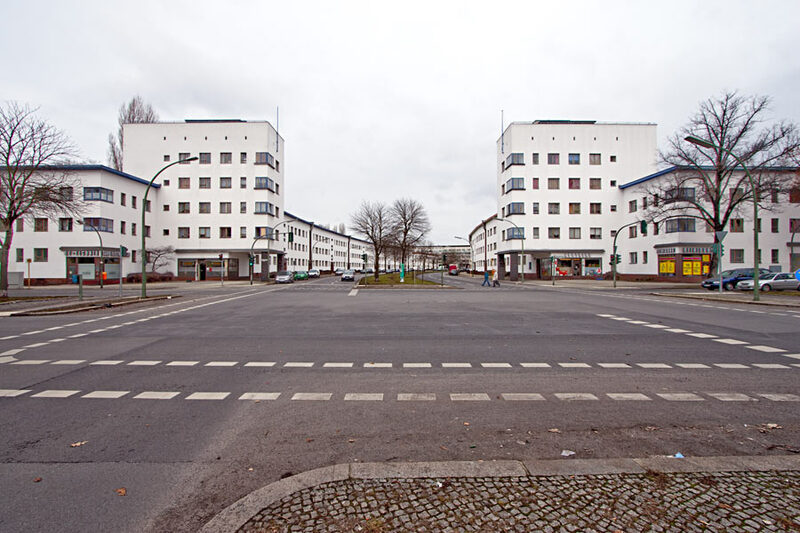 Today however, times have changed and the buildings are generally regarded as an ugly remnant of the reconstruction of Hamburg and the economic miracle of the 1950’s and most people would be happy to see them demolished. Which is exactly what is about to happen. 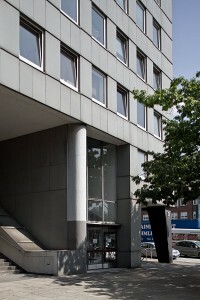 Once the current tenant, the district offices Hamburg-Mitte (Bezirksamt Hamburg-Mitte) moves to their new Hafencity home which is currently under construction, the plan is to taer down the buildings and open the area for redevelopment in order to provide a better connection between the inner city and the new Hafencity district. Due to the use of asbestos in the buildings (the facades for example are clad in gray fibre cement panels which contain asbestos), a rehabilitation of the complex would become very expensive. And since the City Hof buildings are not considered to be outstanding architecture (there has been an attempt to put a preservation order on them, which failed), they will be gone soon, and it doesn’t seem like they will be missed. You still have to appreciate the architectural concept though. 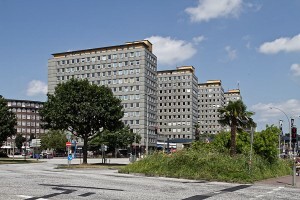 The complex consists of four high-rises with 12 (buildings A, B, C) and 13-storeys (building D), standing on a nearly exact west-east axis, slightly offset against each other due to the course of the road Klosterwall. Lower two-storey sections connect all buildings. While these look like a solid body from the outside, they are actually comprised of two rows of buildings that leave a north-south passage in between which runs through the entire complex. At regular intervals, openings to the east and west provide additional permeability, so the passage can be entered from any side. The passage is lined with small shops and was actually one of the first shopping passages in Hamburg, many of whose today define the commercial center of the city. The complex also includes a parking lot and a small auto shop. Because the site is located on a slope, you can’t cross the passage from north to south without climbing stairs. There is a large staircase at the south end, which obviously at one time featured an escalator as well. Maybe it is still intact, but it is hidden under a wooden shed. Walking upstairs and along the passage, there are more, smaller staircases along the way. 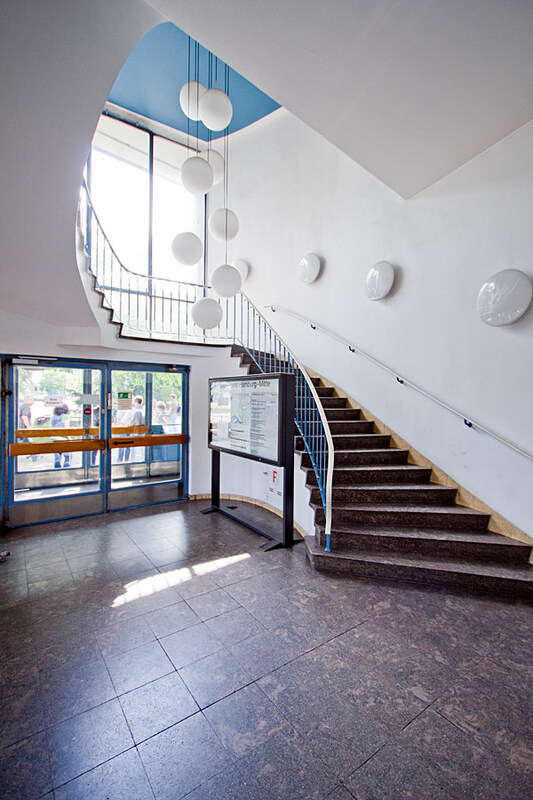 There are no elevators provided for disabled people, but you can go up the slope along Klosterwall or Johanniswall and enter the passage through any of the entrances on the east or west side. A note on the facade: while it seems to be verified that the facade has at some point in time been replaced, there are varying stories about how the building looked before. While a Wikipedia article states that the original facade was darker than the current one, other sources claim that the buildings were originally clad in white tiles. I couldn’t find any historic photos that would clear things up, but the latter version is backed by the fact that white tiles can indeed be found at the various side entrances of the complex. 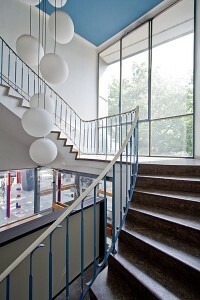 While I haven’t investigated the inside of the buildings, I still entered the lobby of building D, the southernmost building, whose lobby spans two-storeys and features a spiral staircase along a glass wall leading up to the first floor. On the northern wall there are two sets of elevator doors. The staircase is not free-standing as in one of the buildings at Grindelberg housing complex which was built a little earlier, but it shares a similar, typical 1950’s look. In the well hole, there are several large drop-lights with spherical lampshades. Going up the stairs you’ll realize that the ceilings of the first floor are rather low. Heading further up, you enter a very narrow and dimly lit stairwell, which is somewhat contrary to the open, airy feel that the lobby provides. Going back outside and into the passage, you’ll notice that it is mostly void of people and that the shops are either deserted or very shabby. It only gets somewhat lively on the outside of the complex at the front towards Klosterwall, where the shops have a bigger exposure due to the large street. This is one of the core problems of the complex: the passage is not used by pedestrians, making it hard for shops to survive there. 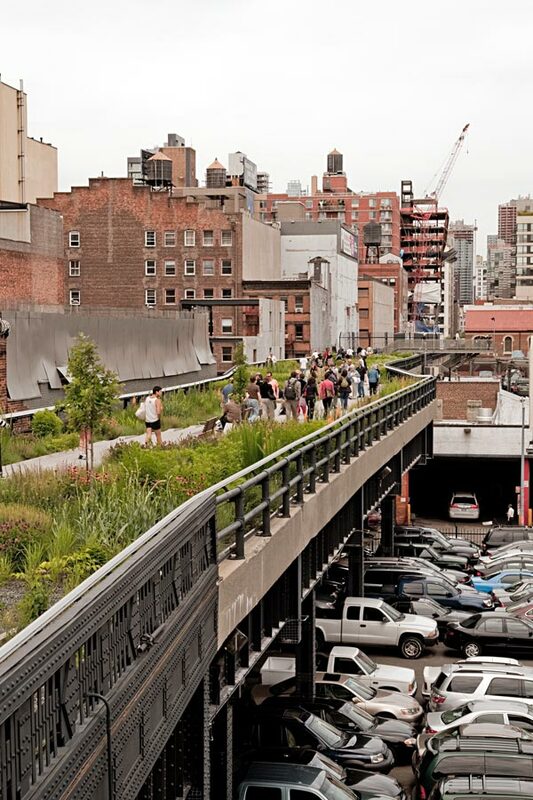 While the concept of offering pedestrians a quiet shopping passage away from the busy street seems agreeable, it is possibly the location of the entire complex that causes the concept to malfunction. 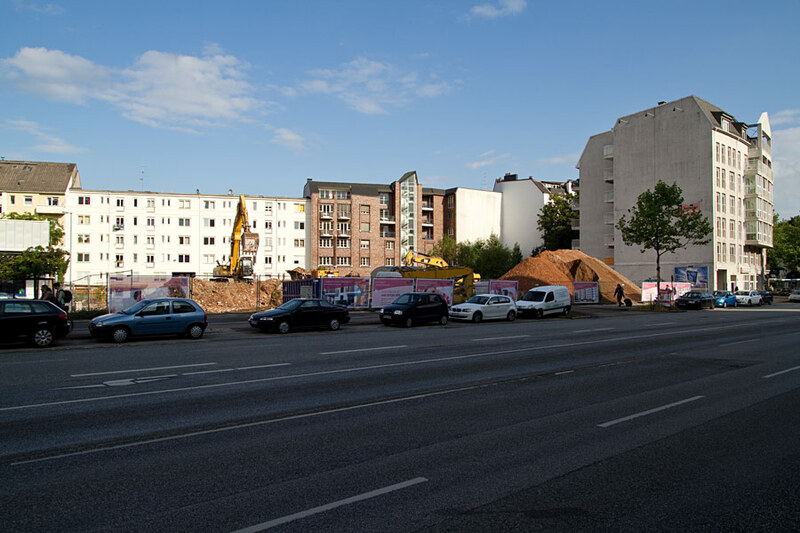 You can’t help but realize that the area immediately south of busy Mönckebergstraße – one of Hamburg’s main shopping streets – feels a little like the backyard of the city. There you will find the old office building district (including architectural gems such as Chilehaus, just a stone’s throw away from City Hof) which attracts many workers but few people willing to spend money. 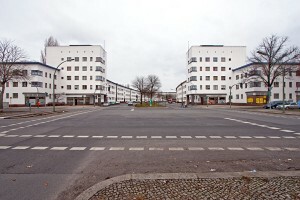 The same problem can be observed in City Nord, where numerous large corporate headquarters are located around a central shopping zone, which is equally deserted. City Nord was built in the 1960’s and grew from a decision to keep large company headquarters out of the already crowded city center. Before, Unilever headquarters at Gänsemarkt was built as a guinea pig, but it quickly showed that the workers would arrive by car or subway and disappear into the building in the morning and leave at closing time without frequenting the surrounding shops. 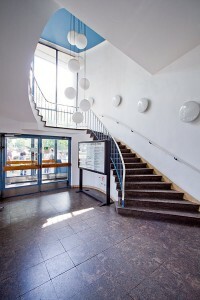 Outside Building D - Main entrance and large lobby window to the right. Stairs on the left leading up into the passage. Note the remains of a former escalator. At the City Hof passage, there are only a few specialized shops that are able to succeed under these circumstances, like a large Asian supermarket which has its customers coming from far away throughout the city. The rest of the shops, like travel agencies and kiosks, seem pretty shabby. Shops that depend on a continuous stream of pedestrians cannot succeed in this environment, as it seems. The relevancy of the axis between Central Station and Hafencity along which City Hof is located will be redefined though once Hafencity development reaches the area to the south. Klosterwall will become the main route for entering this part of Hafencity from the city center, and both motorized and pedestrian traffic will increase. This holds the chance to restructure the area and lead more pedestrian traffic through this corridor. And with that, the usage of the City Hof passage may increase. However, the complex may not be around long enough to prove this theory true: as part of the redevelopment of the area, City Hof is scheduled to be torn down and replaced by new buildings with probably a different concept. To those who care enough to take a close look at City Hof, it will be remembered as one of those very clear concepts of modern architecture and city planning which didn’t work out quite as well in reality as on paper. See the full series of photos of City Hof in this flickr set. A view of the current condition of the site. 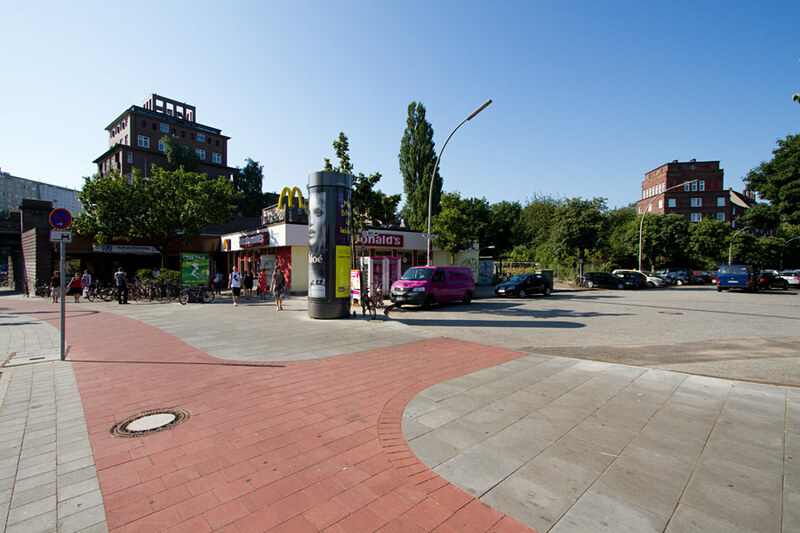 Straight ahead is the Mc Donald\’s restaurant, behind it to the left is Hoheluftbrücke subway station and to the right the empty lot. 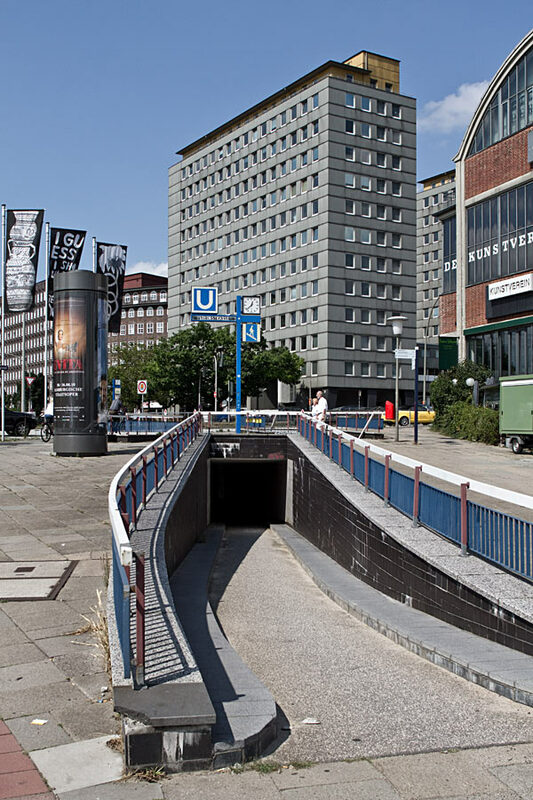 There is a place next to Hoheluftbrücke subway station in Hamburg which consists of a small building with a fast food restaurant inside and some unused land behind it stretching for some 50 meters along the subway tracks (this lot actually holds a bomb shelter). 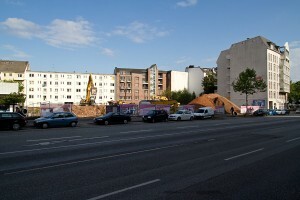 In 2007, an investor made plans to demolish the restaurant and build an office building (they called it “Hoheluftkontor”) on the site (which as a side note would again include space for the same fast food restaurant). 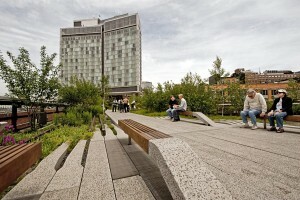 They also wanted to create a square in front of the building with a café next to the Isebek canal. The building was planned to have six storeys that would raise out of a cubic-shaped base and which would then step back irregularly and form a kind of tower on the side facing the main street, Hoheluftchaussee. 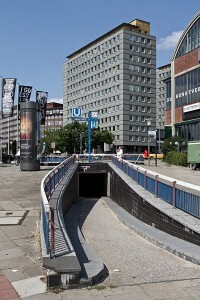 Thus, it would provide a counterpoint to the tower of the historic “Klinker” building on the other side of the subway tracks, creating a gate through which the subway would run. 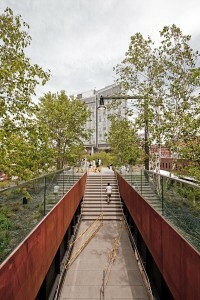 The building would be clad in red brick in a nod to local building traditions. The project however soon faced opposition from an initiative that was concerned about the natural landscape along the canal, which might get partly destroyed by this “monolithic building”, as they put it. After some discussions between the disctrict administration and the initiative, a compromise was offered, which included the reduction of the building height by one storey and abandoning the plans for the riverside café. The initiative did not accept this compromise and requested a referendum. Things started to heat up in the following time, with both parties slashing each other’s claims and actions. In the end, it was hard to make out the facts from the massive amount of agitated rhethoric. Even for people who tried to stay informed about the project, it became hard to sort out the facts wihout getting swept away by propaganda from both sides (as a matter of fact, I am finding it very difficult to write this article and decide which facts to include and which to omit. The whole story if far more complex than I can reproduce here). In my opinion, most of the facts stated by the initiative seemed very shallow and wouldn’t stand an in-depth examination. In fact, the only claim worth considering that I noticed was the traffic situation: leading the traffic for the office building through the surrounding network of quiet residential streets would lead to an increase in traffic and thus of traffic noise, and would aggravate the problem of finding a parking lot in this notoriously crowded area. It’s not that the office workers couldn’t get to work by subway, you could literally jump from the station into the building and vice versa since it would be located directly adjacent to the station. But many people probably would still prefer to drive to work in their car. The referendum was finally held on July 1st. With a voter turnout of only 23,34%, 68,66% of the voters voted against the building. I was somewhat irritated by the low turnout, but then a phone call with my parents gave me a key to understanding the situation behind the results. My parents live in another borough some kilometers north of the site in question, but since it belongs to the same district, they would be eligible to vote. On the phone, my father said to me “We got a letter concerning this referendum. We threw it away. What do we care about some building to be built down there.” Thinking about it, this might be exactly the reason why this vote ended up the way it did: most people just don’t care about voting for or against some building somewhere in town (there’s a vast number of buildings being built in the city at any time after all), unless they happen to live right in the neighborhood. And in the neighborhood, the initiative did its work well. Add to that a generic “all new things are evil and everything in our little world should stay as it is” attitude and you’ve got a good chance to turn down any project in question. But even if you are not completely dismissive, it’s hard to get all facts sorted out and make up your mind about the topic. After all, why spend your time researching on the topic in order to come to a decision if the only way you will ever deal with the building is when you drive past it on your way into town? Why fight your way through the semi-facts that both parties throw at you when its blatantly obvious that both parties are trying to convince you with agitated rhethoric instead of useful facts? It’s just a building, it’s not worth the hassle. People have better things to do than worry about some random construction project somewhere in town. In this respect, it becomes obvious why so many supporters of the initiative cast their vote: because they were the only ones who cared. This raises questions about the reasonableness of referenda. Although they may at first seem to be the most democratic solution for confrontations like these, an imbalance is created in reality between the creators of the initiative, who work hard for their interests to be considered, and the general people to whom the referendum is meaningless and who thus don’t cast their vote. With development of this place averted by the vox populi, the lot will – for now – stay just as it was. 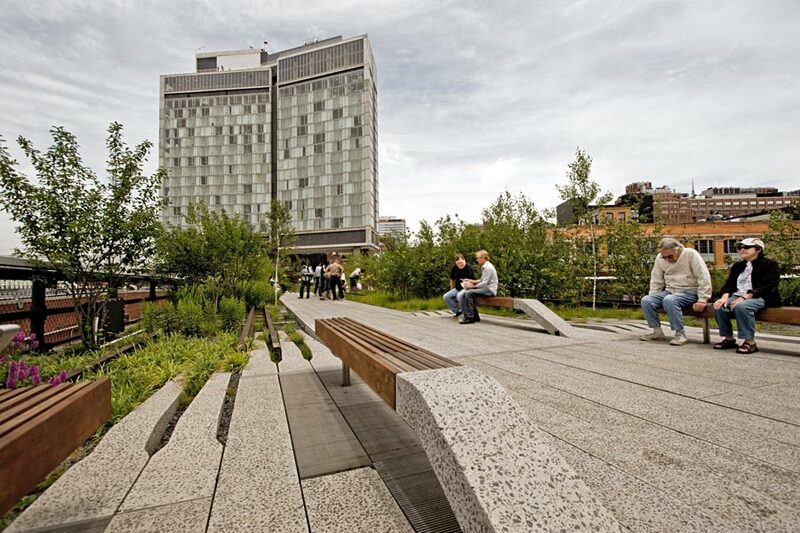 The initiative aims to have a public park built on the site, but the borough administration already turned that idea down, saying that a park is out of question and had always been during the discussions. So for now, Hoheluft residents will have to continue living with an undeveloped lot that continues to attract shady types and does not provide am enjoyable public area. Please note that all posts older than this one have been previously released on my blog at Kotogoto and have been migrated to this blog.